The Independent Business Survey, which is conducted by the Institute for Local Self-Reliance in partnership with the Advocates for Independent Business,is now in its 9th year and gathered data from over 3,200 independent businesses. The respondents reported brisk sales in 2015, with revenue growing an average of 6.6 percent. Among independent retailers, who comprised just under half of survey respondents, revenue increased 4.7 percent in 2015, including a 3.1 percent gain during the holiday season. These figures contrast sharply with the performance of many national retail chains, and overall holiday retail sales, which rose just 1.6 percent in December according to the U.S. Department of Commerce. Local First Arizona also received the Arizona-specific results of the study, with more than 560 survey responses coming from Arizona-owned independent businesses. Arizona businesses reported a higher rate of revenue growth of 7.1 percent than the national average of 6.6%. Arizona retailers also reported a 5.2 percent holiday sales gain, nearly 60% higher than the national average of 3.1%. This growth led to a significant increase in hiring nationally. Overall employment at the independent businesses surveyed expanded by 5.6 percent in 2015, with more than 30 percent of respondents reporting the addition of at least one employee. Arizona businesses reported an identical figure of a 5.6 percent increase in number of employees over last year. 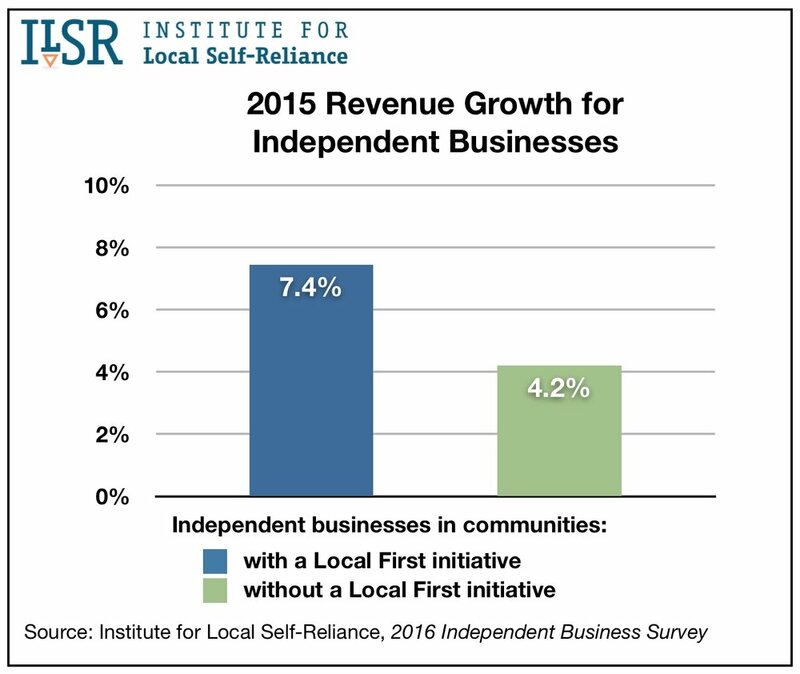 Local First initiatives are part of what’s strengthening independent businesses, the survey found. Two-thirds of respondents in cities with an active Local First, or “buy local,” campaign said that the initiative is having a noticeable positive impact on their business, citing benefits such as new customers and increased loyalty among existing customers. Arizona saw similar numbers, with nearly two-thirds of respondents reporting a noticeable positive impact. About one-third of businesses in Local First cities also said that the initiative had led them to become more engaged in advocating on public policy issues, and 44 percent said that the campaign had made elected officials more aware and supportive of independent businesses. In Arizona, 39 percent of businesses said that they have become more engaged in advocating on public policy issues and 42 percent said that the Local First Arizona campaign has spread awareness to elected officials. These numbers in the Independent Business Survey are also significant because independent businesses are facing a number of challenges, many related to public policy. One obstacle is a lack of credit for businesses seeking to grow. The survey found that one in three independent businesses that applied for a bank loan in the last two years failed to secure one. That figure was 54 percent among minority-owned businesses, and 41 percent among young firms, whose expansion has historically been a key source of net job growth. In Arizona, these numbers were much higher with nearly half of independent businesses who took the survey saying they had applied for a loan in the last two years but were unsuccessful in obtaining a loan (45 percent). An additional 16 percent responded that they were successful in getting a loan but not for the full amount requested. Only 39% of surveyed businesses who said they applied for a loan in the last two years reported successfully finding a lender for the full amount. Competition from large internet companies is also a top challenge for businesses in Arizona and across the nation, particularly for independent retailers, 70 percent of whom ranked it as very significant to their business (62 percent in Arizona). Another leading obstacle is the fact that large competitors can use their market power to secure better pricing and terms from suppliers. On the policy side of these challenges, majorities of the businesses surveyed in Arizona and nationally said they would support legislation to cap the dollar value of the economic development tax breaks that companies are eligible to receive, and that they think regulators should more vigorously enforce antitrust laws against dominant companies. The rising cost of commercial rent is another difficulty facing many independent businesses. Among retailers who lease their locations, 59 percent reported being worried about the increasing cost of rent (66 percent in Arizona). The steep swipe fees set by credit card companies are also a challenge. A large majority of retailers (73 percent in Arizona) favored government action to cap credit card swipe fees, as the E.U., Australia, and other countries have done. The survey also saw some positive feedback from local Arizona businesses who completed the survey about our efforts. Thanks to all of our local business coalition members who participated in the survey! "As a sole proprietor offering a specialized service, I feel supported in my community because of my membership with Local First Arizona. It's been a privilege to volunteer with LFA at their events and by providing editing services as needed." "I've felt a real increase in the desire of customers to shop local and support smaller shops"
"Local First Arizona has been an excellent addition to our list of company membership in Trade Groups. It has been a great tool for sales and we finally have a legitimate source to demonstrate to potential clients the benefit of purchasing locally. Buy local rings hollow without the facts to back it up and Local First AZ has given us the facts to help a client that is on the fence to make an intelligent decision for supporting our local economy." "Local First Arizona and Kimber Lanning have done a fabulous job of raising awareness of buying local and supporting local businesses." To read the full study, check out the Institute for Local Self-Reliance's website.